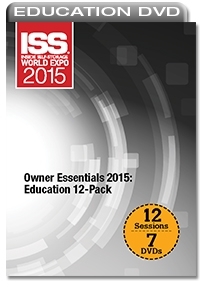 Get 12 education sessions that address essential aspects of self-storage ownership. This discount bundle offers insight to building a successful operation, staffing, risk management and more. Buying and Operating Your First Self-Storage Property: Year-One Success - Stress and confusion can accompany your first self-storage acquisition and learning operational best practices. This session eases the burden of new ownership by offering key steps to first-year success. Coping With the Stress of Being a Small Operator in a Big Self-Storage Market - While large self-storage companies possess certain operating advantages, independent owners can carve out healthy market share by implementing smart strategies related to marketing and money management. Creating Your Self-Storage Security Program: Tools and Practices - Learn about best practices and cost-effective technologies that can add sophistication to your self-storage security program. Studying Your Self-Storage Competitors and Leveraging the Data – Learn how to gather and leverage data about competitors to market your points of differentiation. An Open Discussion on Self-Storage Manager Compensation - Examine key considerations including the difference between rental commissions and salary, designating ancillary commissions, rewards, benefits and more. Employment Laws and How They Apply to Self-Storage - Increase your familiarity with today’s employment laws, including legal restrictions that affect you as a self-storage operator and common human-resources errors to avoid. Self-Storage Recruitment and Hiring: Finding Your Best Manager - Learn a fresh approach to hiring the right self-storage manager the first time, including where to find quality candidates, how to evaluate applicants, how to cultivate solid interview questions, and more. Cyber-Liability Exposures for Self-Storage Operators: Understanding Your Online Risks - Technologies used by self-storage operators are subject to privacy and data breaches that could be costly to business. Learn about the potential for exposures and how you can manage and mitigate risks. Risk-Management Best Practices for Self-Storage - Learn the right way to protect self-storage property and revenue with this overview of insurance policies, industry-specific endorsements, the underwriting process, limits, deductible options and more. Understanding and Fine-Tuning Your Self-Storage Rental Agreement - Learn how the key terms and conditions in a self-storage rental agreement impact your legal relationship with customers.